Who became New Amsterdam’s First Citizens? Who were Excluded? Practically all of the original 237 adults who claimed New Amsterdam’s burgher right in April 1657 were male, some acting independently, others as heads of their household. Wives of burghers were legally considered city citizens and did not have to appear. Four women are on the original burgher lists: three widows and Mettie Wessels, a free woman and merchant. By taking the burgher oath, free city citizens formally bound themselves to their municipal government. Thus, the burgher right was not available to those who were legally bound by another commitment. One such group was indentured servants. A considerable number of “servants” arrived with their masters from 1657-1664 but they would have been excluded from the burgher right because of their bonded status. Soldiers in the Dutch Atlantic were also excluded from local citizenship while in the WIC’s service but it was understood that once released from their commitment to the Company, soldiers could take the burgher oath. Finally, enslaved Africans were excluded by virtue of their bound service, as this was the legal distinction being applied to slaves at the time. Those Africans who had been freed from slavery would technically have been eligible for burgher status but the names of the few known free Africans do not appear on the burgher lists. This may have been due to the fact that many of those free Africans were given land beyond that city walls, thus making them unable to meet the burgher residency requirement. Only one name, that of Anthony More who took the burgher oath in 1658, suggests the possibility that the man was an African of “Moorish” descent. Jews were the only group initially excluded from city citizenship; the Court of Burgomasters and Schepens initially denied Asser Levy’s request for the burgher right when he appeared before them on 11 April 1657. Levy was one of three Ashkenazi Jews who arrived in New Amsterdam in 1654, the same time an additional twenty-three Portuguese Sephardim from Brazil sought refuge in the city. At the time, Stuyvesant tried to bar them from the colony, claiming that their poor economic status would be a drain on the colony. He was overruled by the Amsterdam directors who ordered that these Jews be allowed to remain in the colony if they took care of their own poor. Levy justified his claim to the burgher right stating that he had served watch with other burghers and had been a burgher of Amsterdam. The court referred his petition to Stuyvesant and Council who, remembering their earlier admonition from Company directors, granted Levy’s petition, and that of several other Jews, who were then allowed to become New Amsterdam burghers. After April 1657, the burgher right was easily available to new arrivals either by marriage or purchase. Thus, for those not otherwise bound, availability of the Small Burgher Right made inclusion as a municipal citizen essentially a matter of choice for most newly arrived white Europeans. From 1657 to 1664, an estimated 1,079 individuals arrived in New Amsterdam, traveling mostly in families and moving beyond the city to other parts of New Netherland. We know that among those who remained in the city, at least 92 new arrivals agreed to pay the reasonable fee of 20 guilders for the Small Burgher Right. The magistrates often offered incentives to accept the burgher right by accepting bonds and alternative methods of payment. Excluded from the burgher right were those who did not keep fire and light nor pay the fee. New York City Municipal Archives, New Amsterdam Records, Administrative Minutes, Volume 1, page 16. New York City Municipal Archives, New Amsterdam Records, Court Minutes, Volume 2, page 138. Petition of Abraham de Lucena and other Jews for leave to trade at the South river and Fort Orange, November 29, 1655. 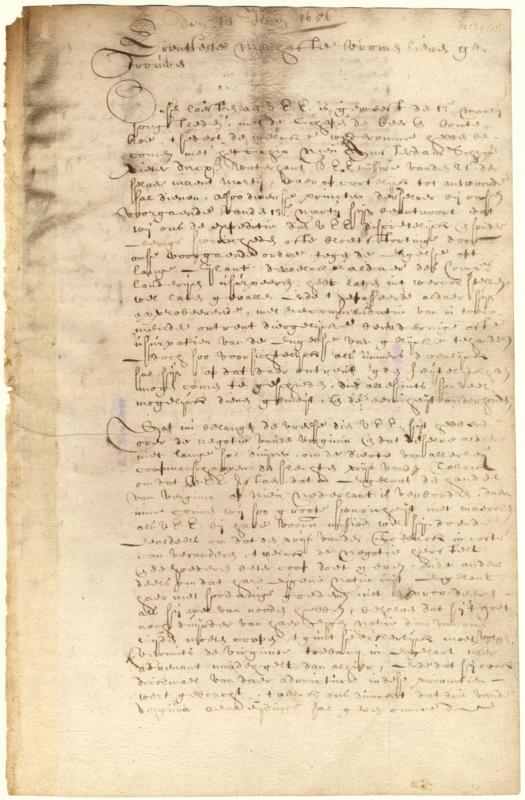 The letter condemning Stuyvesant for not obeying orders to permit Jews to trade and buy real estate but granted restrictions on Portuguese Jews to be employed in the trades.